We've given you ten reasons why Star Wars: The Clone Wars would rock the awesome, shown you sneaks at the new cast members and behind the scenes glimpses of the making of the movie, and even made Annalee into a very excitable, kill-happy droid. But, with the actual movie coming to a theater near you tomorrow, you may be wondering whether it'll be worth your time and money. 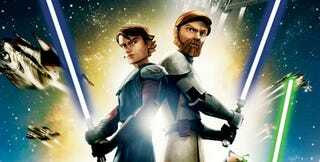 We've got an answer for you under the jump.Whether or not you really enjoy The Clone Wars probably depends on how you approach it; if you're going in expecting the most awesomest animated movie ever made purely because it's Star Wars, then you're going to be disappointed (That's still Ratatouille). Similarly, if you're expecting something that's going to be just like the three prequel movies, you're not getting that, either - but that's a good thing. While Clone Wars shares both characters and a tendency for unfunny humor with Episodes 1 through 3, it's also less weighed down with its own mythology and faster moving than any Star Wars movie you've seen recently. There's a lot to like about the movie, not least of which is the fact that the plot steers relatively clear of the main clone vs. droid war to something that is complete in and of the movie itself, and stars everyone's favorite Hutt (and his family, who you've already read about by now). It starts out incredibly strongly, with a newsreel-style intro that's reminiscent of the scrolls of the earlier films, but updated and appropriately over the top for this new series, giving you all the history you need to know in order to enjoy what you're about to see. Sadly, almost everything that follows, no matter how fun it ends up being, fails to live up to that opening. It's not that anything about the movie is bad, as such, because it's completely enjoyable throughout. The problem is that it's "just" enjoyable, and you want it to be so much more, very much like the most recent Indiana Jones movie, with problems including that the animation only really comes to life in the battle sequences (partially because that's one of the few times that the characters move in a believable manner), the dialogue errs towards the familiar Lucas clunkiness where plot exposition always triumphs over character, and - most importantly - we're robbed of any real dramatic tension throughout the entire story, because we going in knowing that (almost) all of the main players will survive to appear in Revenge Of The Sith. The one exception to that rule is Ahsoka, Anakin's new padawan learner, who may be the single most annoying new character that Lucasfilm has come up with since Jar-Jar. Ignore Ziro The Hutt (Actually, don't; he's hilarious in an over-the-top charicature way), Ahsoka will have your teeth on edge with her "plucky" nickname for Anakin and overly-familiar "I pretend to be cocky, but really I'm uncertain about my role" demeanor. With her modern (and modern cartoon-sidekick) demeanor, she seems out of place in the more mannered SW universe, and her presence keeps drawing you out of the story and back towards thoughts that someone, somewhere probably had the (bad) idea that they should try and make the movie more "hep" for "the kids" early in the development process. But with all of that said, there's one thing that The Clone Wars manages to do very successfully, and that's make you believe that animation is the best vehicle for this kind of story. Even with the uneven character design (When the characters are very abstracted, like Obi-Wan or Count Dooku, they look wonderful, especially with the little touches like the brushwork color, but less-important characters get less attention, and seem to have wandered in from a Dreamworks movie at times) and uncertain movement, there is a coherence to the look of everything that no amount of CGI/live-action hybrid could touch. I came out of the theater feeling as if the movie had been good enough, if kind of slight, but definitely convinced that the TV series to follow - freed of the scale of a movie theater and able to follow all the interesting side-trips that the movie suggested - would be must-see TV. And maybe that's exactly what the movie was intended for, in the end.